The Port of Dutch Harbor, located in the Aleutians West Census Area, is the largest fishing port in the United States in terms of volume, and second largest in terms of value. Salmon, crab, pollock, halibut, rockfish, and other species are harvested by both local and non-resident fishermen and processed at shore-based plants as well as aboard floating processors. The region’s pollock fishery is not only the largest fishery in Alaska, but also the largest in the world in terms of volume. Much of the pollock harvest is converted to surimi, and marketed as imitation crab. In 2001, seafood-processing jobs directly accounted for 62 percent of the area’s private sector wage and salary employment. 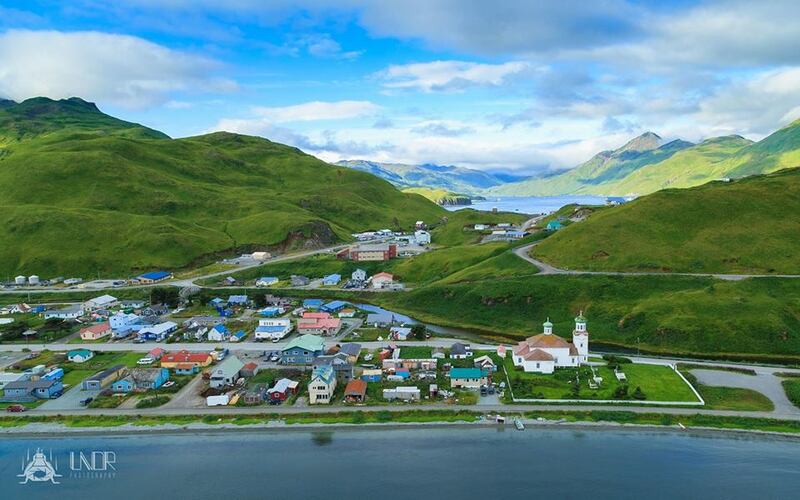 Dutch Harbor, (located within the City of Unalaska), is located on Unalaska Island and is the center of the area’s population and economic activity, which is based on commercial fishing and seafood processing. Unalaska is also the area’s transportation hub, with regularly scheduled service to Anchorage and connections to other Aleutian communities. 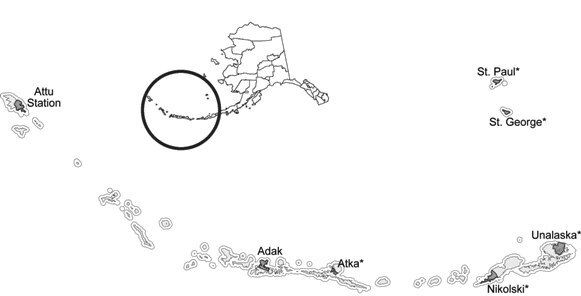 Atka is a second class city in the Aleutians West Census Area, located on Atka Island. Atka sits 1,200 air miles southwest from Anchorage and 350 miles west of Unalaska. After the Japanese attacked Unalaska and seized Attu and Kiska in June 1942, the U.S. Government evacuated Atka residents to the Ketchikan area. Atka was burned to the ground to prevent Japanese forces from using it and advancing. The community was rebuilt by the U.S. Navy after the war, and residents were allowed to return. Many Attu villagers, released from imprisonment in Japan in 1945, relocated to Atka. This exposure to the outside world brought many changes in the traditional culture and attitudes in the community. The city was incorporated in 1988. Adak’s military installations allowed U.S. forces to mount a successful offensive against the Japanese-held islands of Kiska and Attu during WWII. After the war, Adak was developed as a Naval Air Station, playing an important role during the Cold War as a submarine surveillance center. Large earthquakes rocked the island in 1957, 1964, and 1977. The naval station officially closed on March 31, 1997. The Aleut Corporation acquired Adak’s facilities under a land transfer agreement with the Department of the Interior and the U.S. Navy branch of the Department of Defense. Nikolski is an unincorporated area within the Aleutians West Census Area. It is located on Nikolski Bay off the southwest end of Umnak Island, in the Fox Island group. Nikolski is reputed by some to be the oldest continuously-occupied community in the world. Archaeological evidence from Ananiuliak Island, on the north side of Nikolski Bay, dates as far back as 8,500 years ago. In June 1942, when the Japanese attacked Unalaska and seized Attu and Kiska, residents were evacuated to the Ketchikan area. Locals were allowed to return in 1944. In the 1950s, the Air Force constructed a White Alice Communications System here, which provided some jobs. It was abandoned in late 1977. Saint George is a second class city in the Aleutians West Census Area, located on the northeast shore of St. George Island, the southernmost of the four Pribilof Islands. Over 210 species of birds nest on the cliffs of St. George Island. It lies 47 miles south of St. Paul Island, 750 air miles west of Anchorage, and 250 miles northwest of Unalaska. Saint Paul is a second class city in the Aleutians West Census Area, located on a narrow peninsula on the southern tip of St. Paul Island (the largest of the four islands in the Pribilofs). It lies 47 miles north of St. George Island, 240 miles north of the Aleutian Islands, 300 miles west of the Alaska mainland, and 750 air miles west of Anchorage. During World War II, the Pribilof Aleuts were moved to Funter Bay on Admiralty Island in Southeast Alaska as part of the emergency evacuation of residents from the Bering Sea. Unlike other Aleutian residents, they were confined in an abandoned cannery and mine camp at Funter Bay. Unalaska is a first class city in the Aleutians West Census Area. Unalaska overlooks Iliuliuk Bay and Dutch Harbor on Unalaska Island in the Aleutian Chain. It lies 800 air miles from Anchorage and 1,700 miles northwest of Seattle. The name Dutch Harbor is often applied to the portion of the city on Amaknak Island, which is connected to Unalaska Island by bridge. Dutch Harbor is actually within the boundaries of the City of Unalaska. On June 3, 1942, Unalaska was attacked by the Japanese. Almost all of the Aleuts on the Island were interned to Southeast Alaska for the duration of World War II. The Russian Orthodox Church was nearly destroyed by evacuating U.S. Army troops. 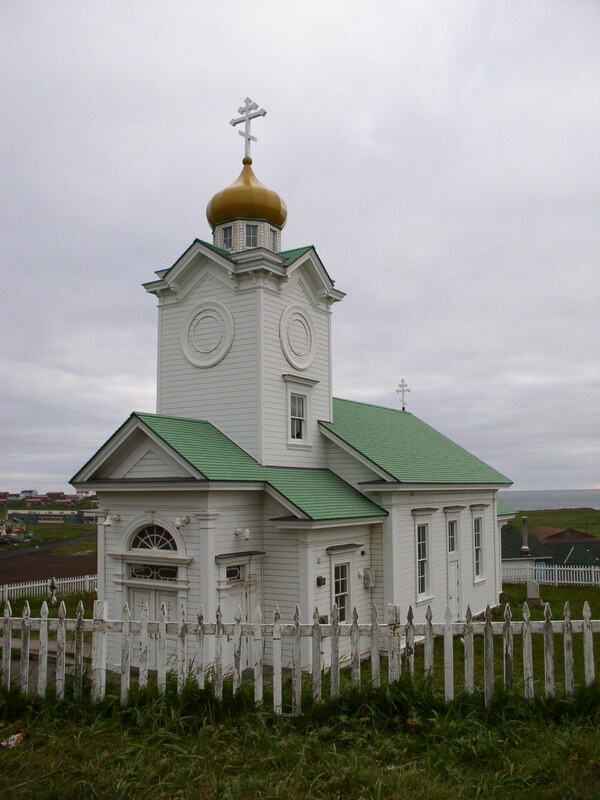 The church is the oldest Russian Orthodox cruciform-style church in North America.